Chiringo Beach is just one of the spectacular coastal attractions that tourists can enjoy when they visit Punta del Este Uruguay.Here is where you will discover deep, clear waters to explore and the shoreline is covered with thick layers of sand. Although you won't be able to enjoy great views of the sunset when you come to this Uruguay beach, there are still a number of other adventures for you to experience. The boundaries of Chiringo Beach stretch between Punta del Chileno and Punta Ballena. All of the Punta del Este coastline attracts tourists each year. It seems as though more and more people are suddenly discovering just how wonderful this region is, and who can blame them? There are many beachfront settings in Punta del Este besides just Chiringo Beach and visitors are welcome to explore all of these public areas. Brava and Mansa beaches provide a variety of adventures and you might be surprised at the differences that you will find between the beaches that lie on the Atlantic Ocean and the shore that kisses the Rio de la Plata. Touring the shoreline at Punta del Este is just one of the many Uruguay activities that you can do when you visit this Uruguay Beach. The cities of La Barra, Jose Ignacio and Maldonado are also part of the Punta del Este region, which means that tourists have a number of choices of places to visit when they want to travel around and see the sights. Young adults are especially fond of the Punta del Este beaches and many of them travel to Uruguay's coast from cities in nearby Brazil and Argentina. You will also find a number of tourists on holiday who hail from the UK, Australia, Canada and the US. It is only a short driving distance from Punta del Este to Punta Ballena where you will discover the natural wonders that are awaiting you when you reach the Chiringo Beach shore. This is a perfect place for those who enjoy being outdoors and there is an untamed beauty which exists here that will mesmerize you from the first time you travel to the ocean's edge. There are many opportunities for you to enjoy some of the more adventurous water sports at this coastal Uruguay setting. 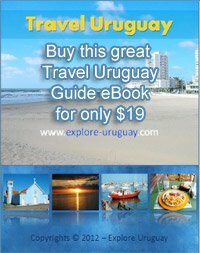 While many of the region's beaches are not quite as popular as those with soft, sandy shorelines, this Beach in Uruguay continues to draw large crowds of curious visitors who want to explore the nearby Grutas. Punta Ballena is famous for these underwater caves and the chance to experience this underwater adventure is one of the area's top tourist attractions.